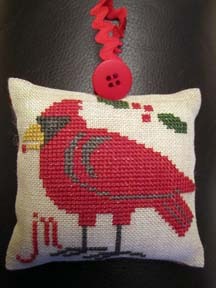 I have not had much time for stitching recently as I have been doing a course for work which has taken a lot of my time up but I have now started again, I received this Christmas Ornament from Nancy Kuelbs this week it is a red cardinal from Prairie Schooler, I posted my exchange at the weekend but forgot to put in a card with the information about what I had stitched, I stitched a design from the Just Cross Stitch Christmas Ornaments 2011 by Janie Hubble Designs called Partridge 2011.I will post a picture when I come back from my holiday we are off to Scotland tomorrow for nearly , I dare not look at the weather forecast as we have had a lot of rain recently we are also going to Orkney for 5 days so that should be interesting. very pretty. love the red.